How did you develop an interest in cricket? I got into cricket because of my father who was a good cricketer himself and played in the Yorkshire Premier League with and against some good quality cricketers. So, my interest developed with watching my father play cricket and things really changed for me when the day came that I was playing against my father's team. I was bowling to my father and he found it hard to bat against me. From then on, he said he saw a talent in me and he pushed me forward in my cricket career. How old were you when your family moved from Yorkshire to Scotland? We moved to Scotland when I was seven years old as my father had businesses in Scotland and the travelling from Yorkshire to Scotland was proving to be tough for him, so we therefore made the decision to move up to Scotland. Explain your cricketing journey through the various levels of cricket in Scotland? Sharif: In Scotland you have a cricket set-up which is based on districts. So, I started playing for my district U15s and then I progressed to Scotland U15s. From there, I progressed through the system to Scotland U17s and then onto Scotland U19s. The next step was to be selected in the National Academy team and then I progressed to Scotland A before eventually being picked for the Scotland squad in 2011. Many believe that cricket isn't very popular in Scotland, can you elaborate on the set-up? There is a professional set-up in Scotland which is improving and becoming a lot more competitive. I am contracted by Cricket Scotland throughout the year and have been contracted since 2011, which is great for me and obviously provides me with financial security also. 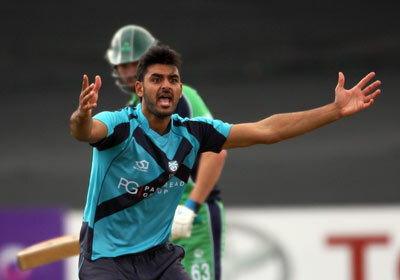 You were born in Huddersfield, surely the dream has to be to represent Yorkshire in County cricket one day? Yes definitely, that would be nice one day. At the moment I am trialling with Northamptonshire, so this will be my third year with them and I'm hoping to make a breakthrough with them this season. Things are looking good this season with Northamptonshire where I have been playing for their Second XI in the past two seasons, but I really do believe that this season could be a promising one for me, so let's see how things go. You were the joint-highest wicket-taker in the recent World Cup qualifying tournament and also named in the Team of the Tournament. That was some competition for you wasn't it? That was definitely the case. It's always good to contribute and put some performances in for the team, and for me obviously the biggest thing was to make sure that I had that level of consistency in my performances throughout the tournament. From a personal level I was very happy with my performances in the tournament. Before the recent World Cup Qualifiers you weren't a familiar name, but after such a good tournament it must be very heartening to have gained so much popularity? Yes it was good to get some exposure especially ending up as the joint-leading wicket-taker in the tournament. In addition, to get the opportunity to play and bowl well in a high-profile match against West Indies was very encouraging too. These sorts of things count and as I say it's all been very good for me during and after the World Cup Qualifiers. What was going through your mind before you bowled to Chris Gayle and dismissed him first ball? I was really nervous the day before the match against West Indies. We had a training session and we had meetings about our plans and what we were going to do when facing West Indies and how we could defeat them. The day before the game there was a lot of nervous energy in me, but then on the day of the match to get Gayle out first ball was just unbelievable. It was such a shock, I managed to land the ball in the right area and he nicked it behind. I just thought 'Oh My Gosh, I can't believe it, has he really just edged the ball?' It was such a great feeling to get a big player like him out because we knew that Gayle was such a dangerous opponent and it gave the team such a good start to the match. So near, yet so far, you must be absolutely gutted to miss out on World Cup qualification and that too in such unfortunate circumstances? It was very disappointing for everyone involved in Scottish cricket. We were really gutted for the fans and everyone else who was behind us and backed us. It was tough on us and I think we deserved to be one of the teams qualifying for the 2019 World Cup. We played some very good cricket throughout the tournament and the way we had to leave that tournament and not qualify was really heartbreaking and tough. In the last game against the West Indies the rain came down, which didn't help. We were also on the wrong end of a couple of bad decisions from the umpires against West Indies and things just didn't go our way. Even in the game against Ireland we had a bad decision against us. These are huge games for the Associate nations, we have to give 100 per cent and make sure that everything is right and when things don't go your way regarding umpiring decisions then that is a huge disappointment. Some games were being shown live on television, yet there was no DRS which shows that the facilities were not quite there from the ICC for the qualifying tournament. That's out of our hands but I think the ICC needs to look at providing full facilities such as DRS for such an important and crucial tournament. How would you describe Scotland's overall performance at the World Cup Qualifiers in Zimbabwe? 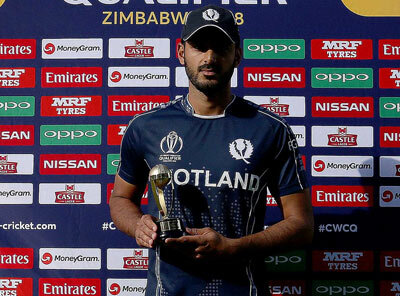 I've been playing for Scotland for nearly seven years now and the way we went about our business and the brand of cricket we played in the qualifiers was just unbelievable and it was so exciting to see how the lads were playing. It was almost like we deserved to be playing alongside the Full Member nations. What are your thoughts on the qualifying process for the 2019 World Cup with only two teams qualifying? It's a very tough process. All of the teams in the qualifying tournament had the ability to beat each other and they were so evenly matched. I just don't understand why the World Cup is only a 10-team tournament. I hope that the ICC can see how competitive and good the qualifying tournament was and re-think the number of teams that play in the World Cup in future. Surely the World Cup should be all about giving more teams the opportunity to play and perhaps shock the major cricketing nations? That's absolutely right and it's quite frustrating that only two teams qualify after such an intense qualifying process. The football World Cup is expanding the number of participants, yet in cricket the number of teams playing in the World Cup is actually reducing. The standard of the Associate teams is improving rapidly and many of the teams are ready to compete with cricket's best teams. I would like to see a change made by ICC where more teams take part in a World Cup instead of just 10 teams. You mention that you felt Scotland played some unbelievable cricket in the World Cup Qualifiers, why do you think that was? Over the last two years as a team we have done really well and continued to improve. We have that belief that we can beat Test-playing nations and that belief that we can win against anyone and we showed that by defeating Sri Lanka and Zimbabwe last year. We've been playing some really good cricket for a while now and we carried that into the qualifiers. We wanted to make a statement at the qualifiers and to show that we deserve to play against the best in the future and I think we achieved that. Do you think central contracts for yourself and your colleagues have been one of the main reasons for improved performances? Yes without a doubt and the more games we play against the world's top sides the better it is for us. Also, the funding from the ICC is a massive boost and the more matches we play against the leading teams, the more interest that generates with sponsors. It was our dream to get into the 2019 World Cup and it was a real driving force for us and I think we did an outstanding job in raising the profile of cricket in Scotland at the World Cup qualifiers. Unfortunately, we just couldn't cross the line, but if a few decisions had gone our way then it could have been a different story. You really need the likes of England, South Africa and India coming to Glasgow and Edinburgh on a regular basis, don't you? Absolutely. When we played in the 2015 World Cup we knew what standards we had to reach. From the 2015 World Cup to date, we've really made progress in terms of the brand of cricket we are playing and to keep that going we need the major teams to give us the opportunity to play against them. This year we have England playing an ODI against us and that gives us a chance to make a statement against a top side. Then we have two T20Is against Pakistan which gives us another chance to show the watching world that we aren't just there to make up the numbers and that we genuinely deserve to be playing against the best teams on a regular basis. How can cricket increase its popularity in Scotland? We need more high-profile matches against the big boys of world cricket. The likes of England, Pakistan are the games that people in Scotland want to watch. These matches generate interest in the media and bring the crowds in. Such games also create interest in the community as young and old want to watch the matches and a couple of wins here and there against the Test-playing nations will just add to the popularity of the game in Scotland. The fact is that the more Full-Member nations we play, the better it will be for the health of Scottish cricket.